The geochemistry of the Maimón Formation (Central Cordillera, Dominican Republic) revisited. The basaltic volcanism of the Dumisseau Formation in the Sierra de Bahoruco, SW Dominican Republic: a record of the mantle plume magmatism of the Caribbean Large Igneous Province. Relict cataclasis in the high-pressure marbles of the Samaná complex, Northeast Dominican Republic. Paleostress evolution during the exhumation of high-p marbles, Samaná Complex, northern Hispaniola. High resolution magnetic, regional gravity and petrophysical characterization of the Dominican Republic tectonic domains with special focus on the Central Cordillera. The San Marcos mélange, Cordillera Septentrional of the Dominican Republic. Nature, origin and age. Marine terraces of the Promontorio de Cabrera (Pleistocene, northern Dominican Republic). Paleogeographic evolution of eastern Hispaniola. Geometry, kinematics, paleostress analysis and tectonic model of the extensional fault system deforming the Plio-Pleistocene reefal limestone in southeastern Dominican Republic. Geology applied to the study of seismic microzoning of Santiago de los Caballeros, Dominican Republic. Mining in Hispaniola at the beguinning of the Discovery (1503-1515). 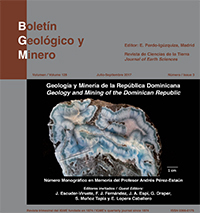 Contribution on the larimar host rock (Dominican Petrographic Republic) and some notes about its origen. Study of fibers and colours in Dominican Larimar. Origin and model formation of the semi-precious Larimar stone in the Sierra de Bahoruco, Dominican Republic.